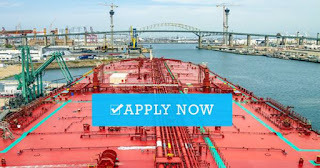 SEAMAN JOB INFO - Tsm Shipping (Phils), Inc. Available hiring looking for an exceptional individual on VLCC vessel deployment January 2019. 1753 TSM Building, (3rd Flr. ), Dian Street, Barangay Palanan, Makati City. Interested applicants may also send their resume to tsmrecruitment@tsmphil.com.ph Tel. Nos. (02) 860 75 29 /860 75 59. 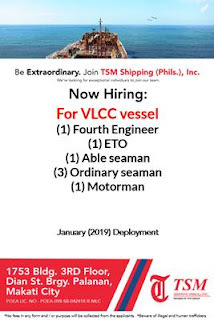 0 Response to "Ordinary Seaman, Able Seaman, Motorman, Electrician, 4th Engineer For VLCC Vessel"